I have many examples of gun control humor, all of which were created to mock anti-2nd Amendment zealotry. 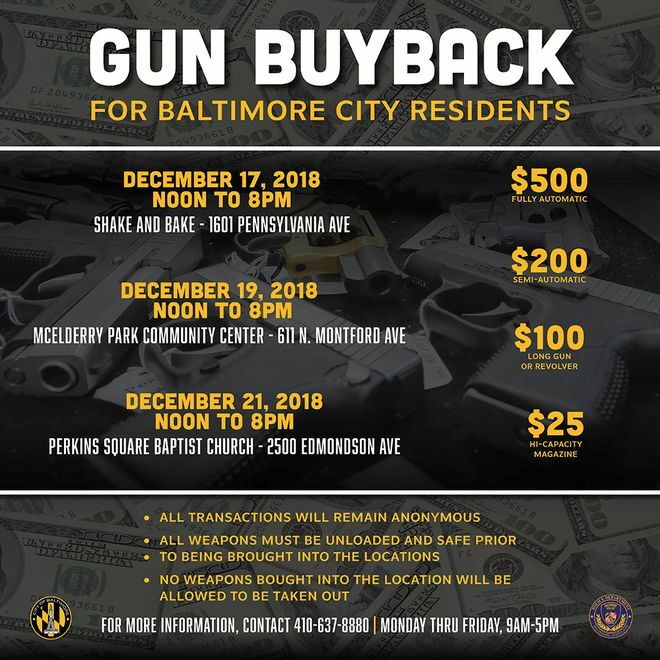 But nothing I’ve ever read is as funny as this week’s gun buyback scheme by the Baltimore Police Department, which was organized by anti-gun politicians and bureaucrats. Here’s what the Baltimore Sun reported about the buyback scheme. Mayor Catherine E. Pugh and Interim Police Commissioner Gary Tuggle announced the launch of the gun buyback program at a news conference Tuesday at police headquarters. Pugh said the program is one strategy to try to reduce violence in the city… “We are coming towards the end of the year and we are doing everything we can to stay under a certain number, but I don’t want to even talk about that,” Pugh said, describing the buyback event as part of the city’s violence reduction initiatives. …Pugh did not say how much the buyback program would cost, but she believes the city has enough money for it. She said nonprofits would be contributing. So why is this so funny? Shouldn’t I be upset that Baltimore politicians and bureaucrats want law-abiding people to give up guns, which will make life easier for criminals? After all, that is bad policy. But there’s a very amusing part of this story. Baltimore is offering $25 for every “hi-capacity” magazine. And this creates a very interesting opportunity to make a quick buck since a quick online search reveals that one popular magazine (holds 30 rounds, so easily qualifies) can be purchased for about $11-$13. Before you buy a truckload of magazines in hopes of some easy cash, I must warn you that there is a slight obstacle. If the poster above is accurate, the buyback is only for residents of Baltimore. P.S. Some of you might feel guilty about participating since taxpayer money will be squandered on the buyback. That’s a noble sentiment. However, the story in the Sun also noted that some of the financing would come from nonprofits. And that means participants will probably be helping to deplete the bank accounts of George Soros and Michael Bloomberg. More money for you and less money for them is a win-win situation. P.P.S. To the best of my recollection, my only other example of gun-buyback humor is at the end of this column. Funny thing; in the free(r) states when they do something like this, people show up and offer to buy any guns that are worth having before the people get to the “official buyback area”. There have been some good finds. BTW: that doesn’t include Maryland. I’m cranking up the 3D printer… !!! If you look at the prices the all they can hope to buy is junk. Not a bad way to get rid of the old stuff that doesn’t work. I not sure what that has to do with crime.